Eduard von Taaffe, a German postcard from 1895. Eduard Graf Taaffe (Count Eduard Franz Joseph von Taaffe; 11th Viscount Taaffe and Baron of Ballymote, in the peerage of Ireland) (Note regarding personal names: Graf is a title, translated as Count, not a first or middle name. The female form is Gräfin.) (February 24, 1833 – November 29, 1895) was an Austrian statesman within the Austro-Hungarian Empire. Taaffe was an excellent organizer, although not an exceptional speaker. He was Prime Minister of Austria from 1868-70 and from 1879-1893, the longest administration during the reign of Emperor Francis Joseph I. He was faced with tension between different national groups, especially between the Czech and German communities in Bohemia. He succeeded in ending a Czech boycott of parliament but it was unrest in Bohemia that finally brought about his dismissal, after which he retired from public life. Taaffe contributed significantly to the democratization process in Austria. Although himself an aristocrat and a member of the social elite, he extended the franchise during his career. His political instinct was to conciliate, to find a middle path between extremes. Most successful peace-making efforts call for compromise on both sides and during his administration he prevented major disruption and unrest within the multi-cultural empire, with its several languages and ethnic communities. Had Austria-Hungary not sided with Germany in World War II, which led to the break-up of the multi-national empire, it may have continued to develop a con-federal system as a model of how to order multi-cultural polities. Its collapse resulted in the formation of mainly mono-cultural states. As the world becomes more inter-dependent, lessons on how people of different faith, culture, and nationality can co-exist and thrive alongside each other without rivalry, are urgently needed. Taaffe's conciliatory instinct may at least point in the right direction for ordering harmonious multi-cultural societies. Taaffe was the second son of Count Ludwig Patrick Taaffe (1791-1855), a distinguished public man who was minister of justice in 1848, and president of the court of appeal. The Taaffe family were originally from Ireland and in addition to their Austrian title of Count they were also Viscounts Taaffe and Barons of Ballymote in the peerage of Ireland. As a child, Taaffe was one of the chosen companions of the young archduke, afterwards emperor, Francis Joseph. In 1852, Taaffe entered the public service. By virtue of the death of his elder brother Charles (1823-1873), who was a colonel in the Austrian army, Taaffe succeeded to the Austrian and Irish titles. He married Countess Irma Tsaky in 1862, with whom he raised four daughters and one son, Henry, the 12th Viscount. In 1867, Taaffe became governor of Upper Austria, and the emperor offered him the post of minister of the interior in Beust's administration. In June 1867, he became vice-president of the ministry, and at the end of the year he entered the first ministry of the newly organized Austrian portion of the monarchy. For the next three years he took a very important part in the confused political changes, and probably more than any other politician represented the wishes of the emperor. In 1867, significant constitutional reforms were enacted that gave imperial subjects a series of new rights. That year, Austria united with Hungary to form the dual monarchy. Hungary had a separate Parliament. The Austrian Parliament, with 516 members of the lower house and 291 members of the upper house, was given enhanced powers. The Imperial Council, previously only an advisory body, was invested with legislative authority. New freedoms were enshrined in the constitution, including universal law and order for everybody without exception, freedom of conscience and of religion, freedom to assemble or to gather, freedom of speech, freedom of scientific research and freedom of movement. The principles of universal equality vis-à-vis the law and inviolability of personal property were also affirmed. In addition, the judicial system was completely overhauled with the decreed (and this was generally upheld in practice) independence of judges at all levels and the “imperial court of law” was established to adjudicate complaints of citizens regional (or local) governments. One very important element in this democratization process was enactment of the mandatory eight-year school-attendance and the abolition of church-control over the school system. A common council consisting of the monarch, the two minister-presidents, or Prime Ministers (one for Austria, one for Hungary), the ministers of finance, defense, and foreign affairs and some additional members, attended to joint business. While the franchise was limited by gender (men only) and by social status (there were land-owning requirements) what was emerging, as argued by Lieven was a different sort of empire, one that was more of a multi-national democratic federation than a large territory held together by fear and coercion. The issue that remained unresolved was whether regions would be given autonomy within a federal system, or the central Reichsrat would remain the locus of power. The Liberal majority favored the non-federalist option. National movements in various part of the Empire wanted recognition of their languages, and other concessions. Taaffe had entered Parliament as a German Liberal, but he soon took an intermediate position between the Liberal minority of the party that advocated a federalist amendment to the constitution and the majority that opposed this. From September 1868 until January 1870, after the retirement of Auersperg, he was president of the cabinet (Prime Minister). In 1870, the government collapsed over the question of further revision of the constitution: Taaffe, along with Potocki and Berger wished to make some concessions to the Federalists; the Liberal majority wanted to preserve the authority of the Reichsrat. The two parties presented memoranda to the emperor, each defending their view, and offering their resignation. After some hesitation, the emperor accepted the policy of the majority, and Taaffe with his friends resigned. The Czechs were demanding a status similar to Hungary's, with a parliament of their own and devolved powers. The regions did have diets (assemblies) but these had very limited functions. The Liberals, however, were unable to continue in government because most delegates from the territories, favoring federalism, refused to appear in the Reichsrat. The government resigned. Taaffe, out of office, was appointed became governor of Tyrol. Between 1870 and 1879, there were six Prime Ministers, with none lasting more than a few months. No one could gather enough support to effect the policies they wanted and in August 1979, Taaffe found himself back in office. Since he had only a loose party affiliation and was known to be loyal to the Emperor, he was regarded as the best choice to follow a middle course between the competing factions. He set himself the task of maintaining a strong center while making concessions to the regions. He persuaded the Czechs, who were boycotting Parliament, to participate by agreeing to establish a Bohemian University at Prague and introduced changes to the electoral system, which had previously favored the minority German-speaking community in Bohemia. They ended the boycott in 1881. Recognition, too, was extended to use of the Czech language in schools but not for official transactions. Through careful concessions, he was able to sustain his administration for 14 years. Taafe also introduced legislation regulating working hours, and accident and health insurance. Count Taaffe is mainly remembered for his election reform of 1882, which reduced the minimum tax base required for males above 24 to vote to 5 guilders. Before this reform, the tax base was set locally, but usually at a considerably higher level, thus including only 6 percent of the male population of Cisleithania (the Austrian part of the Empire). However, even after his reform, there were still four classes of voters whose vote counted differently depending on how much tax an individual was paying. He wanted to introduce universal male franchise but could not muster enough support. 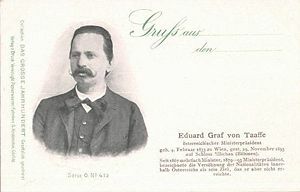 The next election reform was enacted in 1896, by Kasimir Felix Graf Badeni, who succeeded in enacting more radical reforms than Taaffe had achieved by greatly lowering the level of qualifying income for the male suffrage to below five guilders. In 1893, he was dismissed from office due to increased agitation between the German and Czech communities in Bohemia. His dismissal shocked some because he had managed for fourteen years to keep the peace between competing national factions with considerable success. His successor, Count Erich Kielmansegg did not survive long. In 1895, he was replaced by Count Kasimir Felix Badeni, who, attempting to solve the German-Czech issue, declared that German and Czech would both be official languages. Since many people did not speak both, this was wholly unworkable. He was dismissed in 1897, following sessions in Parliament disrupted by Germans from Bohemia. Taafe retired into private life, and died two years later at his country residence, Ellischau, in Bohemia. While not a great creative statesman, Taaffe had a talent for managing men. A poor public orator, in private conversation he had an urbanity and quickness of humor which showed his Irish ancestry, and which people found very appealing. Beneath an apparent cynicism and frivolity, he hid a strong feeling of patriotism to his country and loyalty to the emperor. It was no small service to both that for so long, during very critical years in European history, he maintained harmony between the two parts of the monarchy and preserved constitutional government in Austria. The necessities of the parliamentary situation compelled him sometimes to go further in meeting regional demands than he would probably have wished. An aristocrat by birth, his instinct was pro-democracy and he wanted to draw more people into the political process. Taaffe played an important role in beginning a process of democratic transformation in the Austrian-Hungarian Empire that responded to the winds of change blowing across Europe. Other metropoles—mother countries of imperial systems, such as the Great Britain, France, and Netherlands were now constitutional monarchies. The days of empire were not over, indeed, several empires were still growing, but autocratic, authoritarian rule was less and less popular. How could European condemn the Ottoman Empire as decadent and tyrannical if their own house was not in order? The Empire knew that it needed to liberalize or it would experience the same nationalist uprisings that was tearing the Ottoman Empire apart. Only by granting rights to the different nationalities in the Empire could it hope to survive into the twentieth century. Lieven states, that as a result of constitutional change, by 1900, to a "unique extent" Austro-Hungary was becoming "multi-national democratic federation, able to offer its peoples the economic benefits of a huge market, legally protected equality in status, and the security that was the Empire's traditional boon." It also spent less on its military than almost every state in Europe. Bloch, Josef Samuel. 1973. My Reminiscences. Manchester, NH: Ayer Publishing. ISBN 9780405052545. Boyer, John W. 1981. Political Radicalism in Late Imperial Vienna: Origins of the Christian Social Movement, 1848-1897. Chicago: University of Chicago Press. ISBN 9780226069579. Kann, Robert A. 1950. The Multinational Empire: Nationalism and National Reform in the Habsburg Monarchy, 1848-1918. New York: Columbia University Press. ISBN 9780882548517. Lieven, Dominic. 2002. Empire: The Russian Empire and Its Rivals. New Haven, CT: Yale University Press. ISBN 0300097263. All links retrieved September 25, 2017. Taaffe, Eduard, Graf von at Infoplease.com. This page was last modified on 25 September 2017, at 19:34.